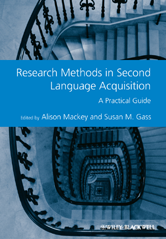 Editor/Author Mackey, Alison and Gass, Susan M.
Research Methods in Second Language Acquisition: A Practical Guideis an informative guide to research design and methodology for graduate students and scholars. Each chapter of this volume offers background, step-by-step guidance, and relevant studies to create comprehensive coverage of each method. Includes chapters by expert scholars on an array of topics, including second language writing and reading, meta-analyses, research replication, qualitative data collection and analysis, and more. Includes feature boxes in each chapter highlighting relevant research studies, discussion questions and suggested further readings. Utilizes research methods and tools from varied fields of study including education, linguistics, psychology, and sociology.